High Flow Pressure Regulators are ideal for applications requiring higher flows, such as solid set sprinklers, low volume manifolds and mechanical-move irrigation systems. All Senninger pressure regulators are constructed of durable high-impact engineering-grade thermoplastics with high quality stainless steel compression springs and securing screws. The pressure regulator shall maintain the predetermined operating pressure provided the inlet pressure is at least 5 PSI above the expected outlet pressure, but must not exceed the maximum inlet pressure rating. Always install pressure regulators downstream from all shut-off valves. Be sure to install pressure regulators in the proper direction. The arrow on the housing shows the direction of the flow and should always point downstream toward emitters. 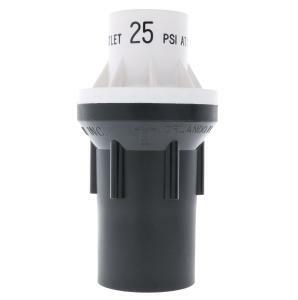 Please note: Irrigation pressure regulators need outflow and back pressure to regulate the pressure within your irrigation system. With no water flowing through the regulator, the inlet and outlet pressures will measure the same. To verify the pressure maintained in your system, you will need to place a pressure gauge at the end of one of zones, turn the zone on, let it pressurize and once the lines have filled and emitters begin to flow then take the reading. This will reflect the working pressure within your system. Special note: This pressure regulator is not designed to operate under static (constant) pressure. It must be installed after any valves or timers to operate correctly. Using this item under static pressure will eventually weaken the internal spring and cause the regulator to fail.